Mobile technology has potential to revolutionize the provision of healthcare. Mobile technology is already having a major impact on the industry. According to PwC, one of the few limiting factors is how the technology can be implemented to allow healthcare providers to obtain the full benefits of the technology. This does not appear to have hindered growth in the sector. PwC has predicted growth to increase six-fold over the course of the next two years. Growth in the sector will mostly come from the development of new mHealth applications and from monitoring services. A new report published by healthcare market research firm Kalorama Information suggests that the growth of mobile health applications will outstrip all other mobile application areas over the next four years. The Kalorama report highlights the substantial growth already seen in the mHealth market so far in 2015. Manufacturers of devices, software developers, and providers of wireless services are capitalizing on growing demand. By the end of the year, the industry is expected to have generated close to $34 billion. The growth seen in mHealth has been fueled by a number of different factors. Mobile devices offer healthcare professionals a convenient and efficient way to communicate and share information. The devices have been welcomed by physicians, nurses, and other healthcare professionals. Information can be obtained and shared rapidly, less time is wasted, and more patients can be treated. Use of the devices can also help improve patient outcomes. Healthcare professionals and medical students are required to access a wide variety of information sources on a daily basis, and mobile devices offer an ideal way for that information to be easily accessed. Apps have been developed to allow information to be accessed securely, while communication of Protected Health Information is possible thanks to the development of secure HIPAA-compliant messaging solutions. Smartphones and other mobile devices are becoming increasingly important for healthcare professionals as the range of functions that can be performed on the devices has increased. Smartphones especially have been widely adopted by healthcare professionals. They are now used not only for basic functions, but a wide range of workflow processes, including education, health management, and data management. They are also now increasingly being used as a replacement for desktop computers for many tasks. 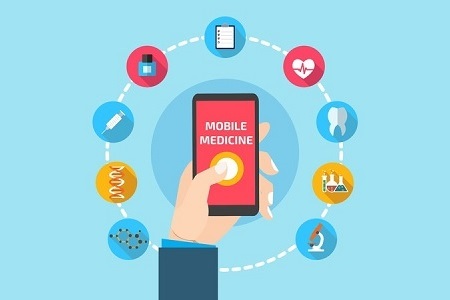 Adoption of the devices by physicians and nurses, together with the extensive development of new apps, has prompted the FDA to take a more active role in overseeing the development of mHealth applications.